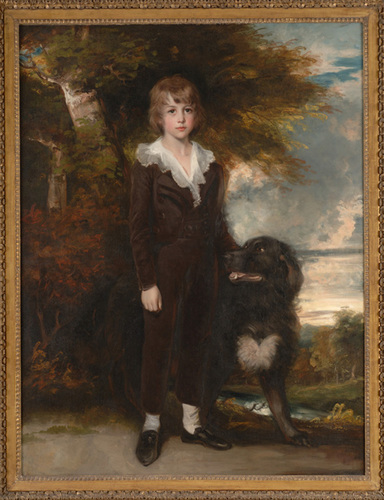 Portrait of Charles Oldfield Bowles as a child with a large black dog. Charles Oldfield Bowles (1785-1862) was the son of amateur painter and musician Oldfield Bowles (1739-1810) of North Aston, Oxfordshire. His older sister, Jane, was the subject of a childhood portrait by Sir Joshua Reynolds, painted around 1775, which is a favorite of visitors to the Wallace Collection in London. This was the first of five John Hoppner paintings acquired over the course of 15 years by James B. Duke. He purchased it in 1908 not long after his marriage in 1907 to Nanaline Holt Inman, a widower from Atlanta who had a son, Walker, of about the same age as the sitter when Hoppner captured his likeness. William Harcourt; sold Christie's, London, February 23, 1907, lot 127, to Knoedler & Co. and Colnaghi; purchased by James B. Duke, October 31, 1908. At Rough Point by 1925; moved to Duke Farms, Hillsborough, New Jersey ca. 1954; returned to Rough Point in 2006.